Cosmos 1: "The Shores of the Cosmic Ocean"
Cosmos 2: "One Voice in the Cosmic Fugue"
Cosmos 9: "The Lives of the Stars"
Have you seen them all yet? In the premiere episode, host Carl Sagan takes viewers on a poetic journey in his "ship of the imagination" from outside the galaxy to the Earth, examining many celestial phenomena along the way. Completing this journey by the midpoint, we switch gears to learn how the circumference of the Earth was measured in 300 BC, to marvel at the lost Great Library of Alexandria, and finally, Sagan introduces the now infamous cosmic calendar. This episode concerns the composition and origination of life, examining natural and not-so-natural selection, DNA, and the chain of evolution from algae to amphibians to mammals to humans - all mapped out on the cosmic calendar. Sagan's colleague Bishun Khare recreates the Miller-Urey experiment to artificially create the molecules of life. Finally Sagan speculates on the "sinkers, floaters, & hunters" - lifeforms that may inhabit the gas clouds of Jupiter. The difference between astronomy and astrology defines this episode, as does the historic struggle of Johannes Kepler to invent one out of the shreds of the other. Key points discussed include the various existing and possible interpretations for the same constellations, the Anasazi calendar as measured by sunlight in their temples, the question of whether the Sun or the Earth was at the center of celestial motions, and the struggle of Copernicus in championing the better answer. The life of Kepler dominates later screen time, culminating in his laws of planetary motion, and his novel of travel to the moon - possibly the very first sci-fi novel ever. This episode touches on asteroid and comet impacts, beginning with Soviet scientist L.A. Kulik's investigation of the Tunguska event in Russia in 1908, proceeding to an impact on the moon observed by Canterbury monks in 1178 A.D., and then discussing the process of impact cratering on Callisto, Phobos, asteroids, the moon, and Earth. Erosion is demonstrated with a visit to the sphinx in Egypt. The episode also focuses on Venus, as our knowledge progressed from observation by telescope, to the concept of spectrograph light analysis, to the data briefly gathered by the ill-fated Venera landing probes. Sagan also stresses the importance of allowing, rather than suppressing, wild theories, adding that "Science is a self-correcting process". It's all about Mars in this episode, as one can guess from the title. Historical speculation from H.G. Wells, Orson Wells, Percival Lowell, Robert Goddard, and even Carl Sagan himself builds enormous anticipation, until finally: the payoff. The automated Viking Lander missions to Mars are dramatized, and we see the first photos taken from the surface, and taste the ambiguity of the initial experiments. We also learn of mission contributor Wolf Vishniac, whose early forging into astrobiology and the study of extremophiles was not without sacrifice. Will we go on to colonize or even terraform Mars? NASA's Voyager 2 spacecraft gets Mankind's first close-up look at Jupiter's moon Europa, and this episode takes us right inside the mission scientific headquarters at Jet Propulsion Laboratories in July 1979 as the pictures come in and Sagan assists the science team in analyzing and theorizing about its icy crust. History in the making! The episode also discusses Io and touches on other planets and moons of the outer solar system. Early segments also portray the age of enlightenment in 1600's Holland that saw astronomer/inventor Christiaan Huygens flourish. This episode tackles Einstein's relativity, light speed problems, the vastness of space, time travel, and other big questions of physics. The episode also tackles the recognition that constellations change over time. King Sagan has his apple pie at Cambridge University, to commemorate the fact that so many discoveries concerning the structure of atoms were made there. After covering the basics about protons, neutrons, and electrons, and introducing us to the 92 natural elements, we pay homage to their creation in the stars, and the episode devotes itself almost entirely to stellar phenomena. We learn about the many different types of stars, and how differently they each form, die, and transform. The episode also touches on gravity, black holes, and possible wormhole travel. This episode goes for the BIG concepts - galaxies, quasars, the Big Bang, the structure and possible oscillation of the universe, alternate universes, and other dimensions. The classic story of Flatland is here to extrapolate the existence of a fourth spatial dimension, along with a 3D "shadow" of a 4D cube. Sagan recounts the story of Milton Humason and Edwin Hubble discovering galactic redshifts in the 1920's, as well as travel to India to note the uniqueness among religions of many Hindu beliefs that parallel modern astronomical theory. This episode focuses on intelligence in its varied forms. After introducing the logical "bit" as a unit for measuring information, Sagan takes us through comparisons of the amount of information stored in DNA of species of increasing complexity, the brains of various species, and finally, books, libraries, and cities. We explore the history of whales, their culture, and what they might make of us humans whose presence has suddenly become so much more disruptive. 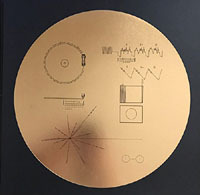 Finally, we take a look at the information stored on the golden record on the Voyager probes leaving our solar system, and what future aliens who discover it might make of us. The focus here is on the search for intelligent life, with Sagan supporting the approach of depending on interstellar radio communication, while curtly dismissing all evidence from UFO encounters that don't fit comfortably within his scientific religion, even as the Betty and Barney Hill encounter is dramatized in some detail. The journey of Champollion in using the Rosetta stone to decipher Egyptian hieroglyphics is also re-enacted. Sagan then takes us through the infamous Drake equation for predicting the number of intelligent civilizations in the galaxy, and makes two calculations with an important difference. We also imagine the exploration of the galaxy from the point of view of two different exploring species who meet each other, and then share their common Encyclopaedia Galactica with Earthlings, which Sagan then browses on the computer in his "Ship of the Imagination". This episode stresses the importance of wisdom in leadership, how very different first meetings between various cultures on our world could be glorious or disastrous depending on the approach of each leader or spokesperson. It asks the question of what first impression we will give when we encounter an off-world culture for the first time, or indeed, if we will even still be around for such a day, or if we will nuke ourselves or otherwise destroy our environment and natural habitat. This is probably the most unique of the many versions of original Cosmos, because the format and sequence of information changes SO MUCH, and because Carl Sagan is back with his writing team, shooting new segments that will be slotted in with the classic footage to bring the programs up to date for 1986, updates that have NOT appeared anywhere on the 2000 Collectors' Editions on DVD and VHS. This box set includes the 13 episodes below... U.S.
also features Patrick Stewart, Alexander Siddig, Kirsten Dunst, Richard Gere, Cary Elwes, Martin Jarvis, Seth MacFarlane, and Marlee Matlin. 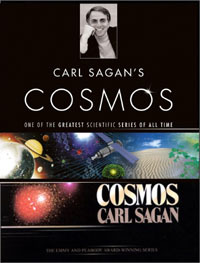 There have been several special albums put out containing various tracks of music used in Sagan's original 1980 Cosmos series. 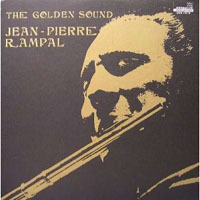 The newer 2-disc version has much more music than the others, but fans were generally not pleased with the noisy transitions between the tracks, often spoiling the beginning or end of each piece. Strangely, all versions seem to have become rare collectors' items by now, with some ridiculous prices being charged. many selections from a variety of artists. 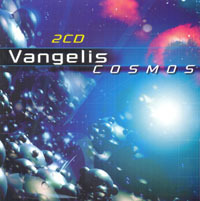 When investigating the detailed music of "Cosmos", it seems obvious that one's first port of call will be the electronically enhanced recordings of Vangelis. There doesn't appear to be an audio CD version of this album. Click on the U.S. Amazon symbol to go directly to the page to purchase mp3 downloads of individual songs, or to listen to samples. Wm. 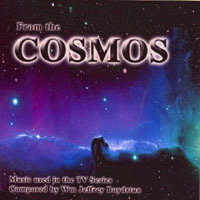 Jeffery Boydstun seems to have had a rare opportunity to actually score much of his music to picture for "Cosmos", and that music is presented here on this album. The album gives us some themes used often across "Cosmos", such as three "In Motion Delta" tracks which can fit together to form one long piece, and "Metamorphosis" which is often used for the Cosmic Calendar as well as many other sequences. There is yet another version of "Metamorphosis" called "Shadows", which is identical except that the ticking synth percussion has been left out - I actually prefer the "Shadows" version of this theme. It appears in episodes 12 and 13 of "Cosmos", and I've a feeling it would've been used earlier if they'd figured it out sooner. Other pieces demonstrate that they were composed for very specific scenes. "Alien Images" 1 and 2 are used during the opening of episode 12. The track "Before Science" contains two cues, one used during the opening of episode 3, and the second appears about half-way through the episode. The song "Nufari" also starts out early in the third episode, while "Life Cycle" covers the dramatic opening of episode 9. I think my favourite piece though has to be "Evolution", which covers a lengthy sequence early in episode 11 where we explore first outer space, and then the variety of life forms under the sea. This was clearly scored to picture, and uses a variety of moods, styles, and instruments. Excellent! I have not been able to find any uses of "Mind Games", "Timesteps", or "Tamara" in Cosmos, but it's likely they did appear as replacements in some mid-eighties versions of the show, before much of the original music was restored for the latest versions. "Tamara" in particular is a nice instrumental piece of up-beat synth pop which I enjoy listening to often. Although it appears that Vangelis himself also had a chance to score new music for "Cosmos", and possibly directly to picture as well, these additions for the 1986 Halley's Comet special versions are difficult to document. As far as we can tell, the only one to be officially released on an album is "Comet 16", and only on the official two-disc "Cosmos" compilation listed above. 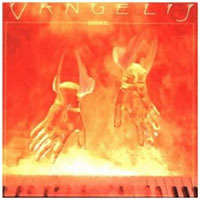 Though five more pieces of music claiming to be Vangelis "Comet" movements have cropped up on faked releases, it seems likely that these have been scraped from the DVD's isolated music/sfx track, as one of them slowly cross-dissolves into the Synergy piece that came afterwards in the episode. This album available on CD, mp3, vinyl, and cassette. 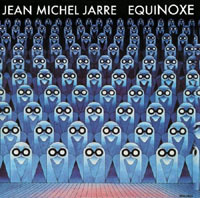 This is the album from which the main theme of "Cosmos" was taken. It is somewhat blunt to refer to the Cosmos theme as "Heaven and Hell, Part One" as often happens, because as it turns out "Heaven and Hell, Part One" refers to the entirety of SIDE A of the original vinyl LP album - a good 22 minutes of music containing some wildly different pieces. 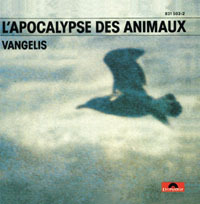 Of course, it doesn't help that the labeling of this and many other of Vangelis' albums is so lazy and clumsy, and you may often find entire sides being sold as a single track, both on CD's and in digital mp3 downloads. Since it is high time that a better breakdown appears on the internet, I'll attempt one here. The actual titles are taken from a listing that appears only on the remastered version of the album, and can be considered "official". "Bacchanale" (4:40). It takes some time to get to the good stuff on this album. "Bacchanale" begins the CD, and truthfully is not that great a piece. I found the composition to be exceedingly silly and completely ineffective at engaging any emotion. The execution also seemed crude and under-rehearsed, with the pounding chorus vocals out-of-sync with the cheesy 70's synth that tried to keep pace. Symphony to the Powers B - Movement 1. There's about 19 seconds of creative piano play in the middle of this otherwise drab continuation of crude overblown choral orchestration. It is less indicative of "Heaven" as it is religious inflexibility. The break between movements 1 and 2 is not obvious - I'm going to guess that it is 3:56 into this piece, with the final chord of movement 1 echoing over the gentle hook of movement 2. Symphony to the Powers B - Movement 2. At last, we improve. 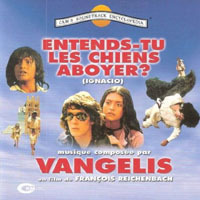 I like this part of the piece, which now resembles a good, interesting, classical piece of music in its composition, realized with the unique sound of Vangelis plus choral accompaniment. My guess is that movement 2 lasts approximately 4:13. Symphony to the Powers B - Movement 3 (4:03). Now this is the beloved theme from "Cosmos", inextricably fused to Carl Sagan's vision of humanity logically slowing down to appreciate the awe of the universe from a standpoint of peace and goodwill. Excellent. So Long Ago, So Clear (4:58). Not being a big fan of sung music, I thought I wouldn't like this, but Jon Anderson does quite good work here, the lyrics seem tasteful, and with so many choral vocals on most of the other tracks on this album already, this does turn out to be one of the better selections here. Good. Intestinal Bat (3:18) delivers some quiet and very experimental music, evoking a spooky, suspenseful mood, perfect for movie scoring. Apparently this did feature in early versions of Cosmos, episode 12, but later versions use tracks by Boydstun instead. Needles and Bones (3:25). This is a lively ol' jig played on echoing marimba and tin triangles, or bones and needles, plus other percussion and synth. Weird. You can picture dancing, smiling skeletons having a laugh here. Twelve O'Clock - Part 1 (Hellish - 3:12). Unlike early parts of Side A, there's a high degree of artistry on display here... used to produce a sound of sickness, decay, and despair. You can hear the frustrated struggle between insects and the corpses of the undead that they've come to feast on here. Oh my! Yes, well done, but I don't think I'll be listening to this very often. Twelve O'Clock - Part 2 (Heavenly - 5:36). This may be the most beautiful piece on the entire CD after the Cosmos theme, a simple but gorgeous harmony swelling up from hauntingly ethereal choirs and a vocal solo by Vana Veroutis. This soothes the soul, for sure, but may leave you a bit sad if you repeat it too often. Don't be surprised if you have a hard time getting it out of your head afterwards. Aries (2:05). A loud piece, with a pompous synth brass and pounding big band drum, as though announcing a marching parade of ... rams? A Way (3:45). The start of this is really merged with the previous track, but it's a nice and rather quiet way of segueing out of the album and ending on a sweeter new age note. More of a mood setter than any kind of memorable melody or song. "Cosmos" uses not only the Main Theme from this album, but also portions of Part One's long mid-section as well. 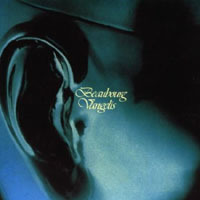 An alternate title for this album and the film it came from is "Ignacio". 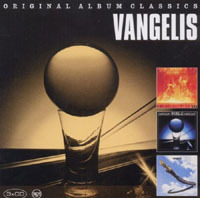 This is another Vangelis album with all the selections for each side of the original vinyl LP crammed together into a single track for CD and mp3 versions. For my own sanity, I have invented some titles purely on my own - They should be considered "unofficial", just aids in helping us identify different parts of the music. Sandwiched between the two versions of the main theme on Part 1 is essentially one big piece of music, which I have arbitrarily split into four. Also, "Rattle Your Pots" and "Twist Your Pan" can easily be considered one long piece. The Main Theme and "Ancient Angles" portions feature often in "Cosmos", but episode 7 also features "Libra Lullaby" from side 2, and a tiny snippet of "Eye of Refuge". This is another important selection of "Cosmos" music, where additional subdivisions between portions of its fairly long movements are advantageous for figuring out exactly which bit of music was used where. 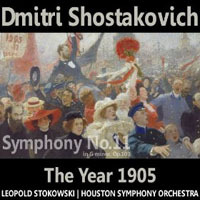 Though this recording by the Houston Symphony Orchestra isn't the exact performance used on the episodes of Cosmos today, it is the exact one used in the official single-disc Cosmos compilation albums listed above. This performance is also listed in the cue sheet for episode 7 of the very first broadcast of Cosmos in 1980. As we have subdivided it here, Part A of Movement 1 is exactly the amount of the composition that appears in the first episode. But of course, why stop at Part A? Part B begins with a gentle melody on woodwinds that "Cosmos" often attached to Johannes Kepler, hence it practically became his "theme", and indeed, all parts of this symphony's heavily atmospheric first movement were used throughout Cosmos. Additionally, portions of the wilder second movement also appeared in Kepler's episode, making the entire glorious symphony quite collectible. 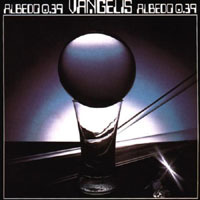 This is another Vangelis album with all the selections for each side of the original vinyl LP crammed together into a single track for CD and mp3 versions. Indeed, trying to listen to the whole thing in one go may drive a person crazy. Each side seems to begin with some of the most challenging material on the album, and end with its most atmospheric. For my own sanity, I have identified naturally occurring subdivisions in the music, and invented some titles purely on my own. "Contemplations", and the final sting(s) of "Winky and Wacky". 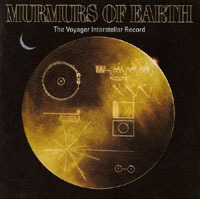 This album contains music, sounds, picture data, and greetings in multiple languages that were on the Voyager Interstellar Record launched with the two Voyager spacecraft now traveling beyond the edge of our solar system. When looking for the music collected on Voyager's Golden Record, BE WARNED - There are several different albums out there that all look very similar, but may be quite disappointing. There's one widely available version with a NEARLY identical cover that has just the sounds and greetings on it - no music whatsoever! 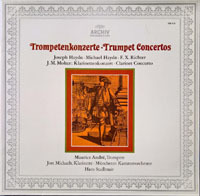 This version with the music AND COMPUTER DATA now seems to be a very rare out-of-print version. Australian Aboriginal songs: "Morning Star" and "Devil Bird"
Louis Armstrong - "Melancholy Blues"
Blind Willie Johnson - "Dark Was the Night"
This album contains music, sounds, and greetings in multiple languages that were on the Voyager Interstellar Record launched with the two Voyager spacecraft now traveling beyond the edge of our solar system. When looking for the music collected on Voyager's Golden Record, BE WARNED - There are several different albums out there that all look very similar, but may be quite disappointing. There's one widely available version that has just the sounds and greetings on it - no music whatsoever! 9. Australian Aboriginal songs: "Morning Star" and "Devil Bird"
18. Louis Armstrong - "Melancholy Blues"
30. Blind Willie Johnson - "Dark Was the Night"
"Cosmos" fans will be particularly interested in "Alpha" which was used often throughout the series, and "Pulstar" which was used in episode 8. This album listed on CD only. "Alpha" is noticeably different in its remastered form, with a greater variety of new instruments and sweeteners joining in on each subsequent verse. This album available on CD or MP3 download. Both the original and the remastered versions of "Alpha"
can be heard in modern presentations of "Cosmos". Click on the U.S. or U.K. Amazon symbols of the Greatest Hits version of the album to purchase mp3 downloads of individual songs, or to listen to samples. This album available on CD only. As you can see, it is often less expensive to go for the version labeled "greatest hits" rather than the one labeled as "Cosmos". and of course, "Theme from Cosmos"
and even then, you'll still be missing out on many of this composer's iconic contributions to the series. Additionally, one might be tempted to think that the Beaubourg track was also a part of "Cosmos". you wouldn't actually be getting any part of that album that was actually used in "Cosmos". 2000 Collectors' Edition with the original 1980 soundtrack.... and reveals a few previously undocumented inconsistencies. beginning with episode 1: "The Shores of the Cosmic Ocean"